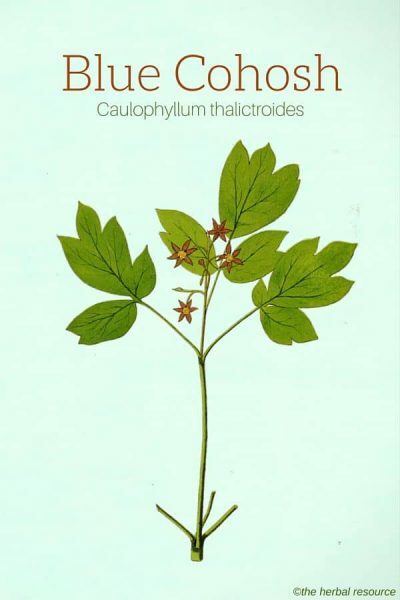 Botanical Name of Blue Cohosh: Caulophyllum thalictroides (L). Blueberry root, blue ginseng, yellow ginseng, beechdrops, pappoose root, squaw root, caulophylle faux-pigamon (French), cohosh azul (Spanish), Frauenwurzel (German), løveblad (Danish), azurbär (Swedish). Blue cohosh is a perennial herbaceous plant native to Eastern USA and Canada. It grows in rich, moist soil near water. Blue cohosh is a slow-growing, perennial plant belonging to the barberry family (Berberidaceae). It can grow up to a meter in height with a simple stem and leaves that are large and tri-lobed. The small yellowish-green to purple flowers appear in clusters from May to June. The fruit is a small dark blueberry which is quite poisonous. Blue cohosh should not be confused with black cohosh (Cimicifuga/Actaea racemosa). Both have been used by Native Americans and European settlers for women’s health conditions. Rhizome and root. These are hard, gnarled and can grow up to 8-10 cm long. They are harvested at the end of the summer when they are thought to be most abundant in their constituents. The rhizome is yellowy brown outside and whitish yellow inside. Its taste is sweetish bitter with an acrid aftertaste. It is available as a standardized extract or liquid extract. The plant contains the substances baptifolin, anagyrine, magnoflorine, tannins, saponins, resins, rubber, citronellol, phosphoric acid, phytosterols, and starch. 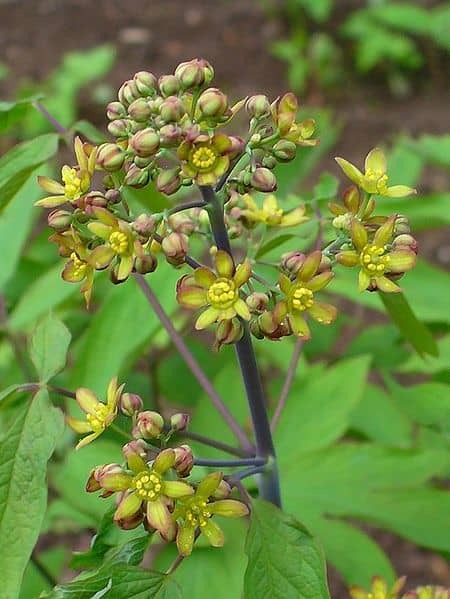 Blue cohosh was once used extensively as a medicinal herb by several native American tribes, and many of the herb’s uses were soon adopted by the European settlers. It was primarily used for ailments related to women’s health, especially during labor and birth. The herb was used to reinforce contractions and restore or speed up slow labor due to lack of muscle strength in the womb. It was also considered to have relaxing effect during labor and to relieve anxiety and pain during pregnancy. The Native Americans also used the root for birth control, for genital and urinary tract issue and a variety of menstrual problems such as heavy, painful periods and lack of periods. Current application of blue cohosh as herbal medicine does not differ significantly from the traditional use. The herb is still considered by some herbalists and midwives as a tonic for the womb and a remedy that can relieve pain in the uterus and fallopian tubes. In spite of being primarily known as a “woman’s herb” it is thought to have other health benefits and uses as well. It may dampen inflammation and is sometimes used to treat arthritis, gout, rheumatic pain and ease stomach cramps. Blue cohosh has also been used when an antispasmodic action is required, e.g., colic, asthma or a cough. This is not an herb suitable for self-medication, and it should only be taken under the supervision of a professional healthcare provider or a licensed herbalist. There are many serious safety concerns with blue cohosh. The berries are poisonous, and there have been few cases where children have fallen severely ill after eating the berries. The root can irritate the mucous membranes, and the leaves and stems can cause skin irritation and contact dermatitis. Side effects associated with the administration of the herb can include chest pain, irritation of the gastrointestinal system, severe diarrhea, cramps, high blood glucose levels, and high blood pressure. Preparations containing blue cohosh can affect women’s menstrual cycle and can alter nature’s timetable when it comes to giving birth. Although the herb has for centuries been used to induce uterine contractions, it is now known that it contains alkaloids that can be toxic to the fetus. It is therefore recommended that the herb is not used by pregnant and breastfeeding women. Blue cohosh may interact with other herbs and conventional medications such as heart and blood pressure medications. Therefore, the herb is contraindicated for patients with heart disease. Romm, Aviva, “Blue Cohosh: History, Science, Safety, and Midwife Prescribing of a Potentially Fetotoxic Herb” (2009). Yale Medicine Thesis Digital Library. 88. 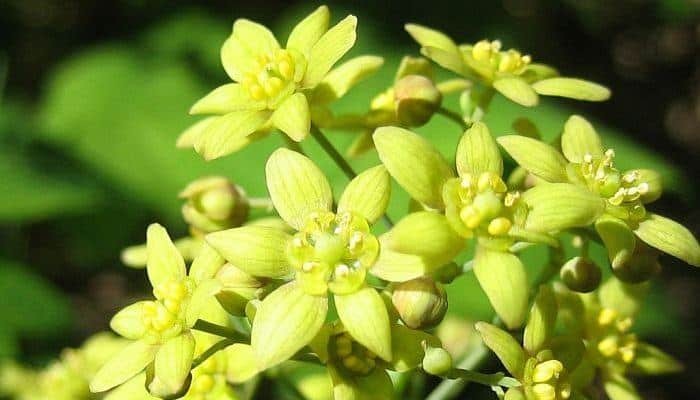 Yeonju Lee, Jae-Chul Jung, Zulfiqar Ali, Ikhlas A. Khan, and Seikwan Oh, “Anti-Inflammatory Effect of Triterpene Saponins Isolated from Blue Cohosh (Caulophyllum thalictroides),” Evidence-Based Complementary and Alternative Medicine, vol. 2012, Article ID 798192, 8 pages, 2012. https://doi.org/10.1155/2012/798192.